Overview - A profoundly stirring evocation of elemental humanity and universal heartbreak, Tokyo Story is the crowning achievement of the unparalleled Yasujiro Ozu. The film, which follows an aging couple as they leave their rural village to visit their two married children in bustling postwar Tokyo, surveys the rich and complex world of family life with the director's customary delicacy and incisive perspective on social mores. Featuring lovely performances from Ozu regulars Chishu Ryu and Setsuko Hara, Tokyo Story plumbs and deepens the director's recurring themes of generational conflict, creating what is without question one of cinema's mightiest masterpieces. Special Features: Audio commentary featuring Yasujiro Ozu scholar David Desser, editor of Ozu's "Tokyo Story"
What is art? It seems like a simple question at first, but try as we might, it's nearly impossible to truly define. Sure, there are many different opinions and ideas about what various artistic mediums are supposed to achieve, but a clear set of guidelines is essentially irrelevant. After all, something as limitless and inexplicable as human expression can't ever be fully classified. And so, we continue to ask ourselves again and again… what is art? To be honest, I don't know the answer. Or at least, I certainly can't put it into words. But, I think I know where it can be found. Layered with delicate texture and peerless insight, Yasujiro Ozu's 'Tokyo Story' is a shining, understated example of the power of artistic expression. Locked within its humble images and tearful emotion is the very rhythm and heartbeat of cinema itself, revealing the full scope of what the medium is capable of. Stripped away of needless flash and overwrought drama, Ozu cuts to the very soul of filmmaking, providing as pure an example of art as any movie ever made. Set in Japan during the 1950s, the movie tells the story of an elderly couple, Shukishi and Tomi Hirayama (Chishû Ryû & Chieko Higashiyama), as they leave their small village behind to visit their adult children in Tokyo. Once they reach the big city they soon discover that their son and daughter don't have much time for them, and instead often treat them like a burden. Thankfully, their widowed daughter-in-law, Noriko (Setsuko Hara), greets them enthusiastically and shows them great kindness. Eventually, Tomi's health starts to decline, and the family is forced to face potential tragedy, further revealing each member's true colors. Though there are certainly instances of classic drama peppered throughout the runtime, Ozu's approach mostly avoids traditional narrative structure and conflicts. Instead, the film follows an episodic format that focuses on various interactions between the family, revealing the daily rituals of ordinary life while chronicling a greater tale about change, aging, compassion, and familial bonds. Throughout it all, the director gradually unveils the harrowing rift between generations, spotlighting our propensity toward selfishness and the tragic inevitability of loneliness. Ozu's view of humanity is far from merely pessimistic, however, and to the contrary, the director offers a deceptively complex and multifaceted view on life, providing examples that run the full gamut of human emotion and behavior. Through the Hirayama family we bear witness to callousness, forced social niceties, precarious cordiality, bitter spite, youthful frustration, sincere love, growing disappointment, unfortunate guilt, lingering grief, and life-affirming kindness. While Ozu's story is irrevocably tied to Japanese culture, his overarching themes and insights somehow remain wholly universal. The emotions and concepts that he so effortlessly taps into go beyond nationality or geographic borders. In his characters we can see ourselves, and in their struggles, pains, and joys, we can see our own lives reflected back with a kind of precision so sensitive and delicate in execution, that it has rarely been rivaled by any other artist in any medium. As Shukishi and Tomi's adult children display increasingly indifferent and irritated reactions to their visiting parents, Ozu heartbreakingly exposes the tragic toll that time and change can have on relationships. Those who were once invaluable are now viewed as nothing more than a nuisance, exposing a reprehensible but often all too accurate reality. Watching the couple be handed off from household to household with little regard is genuinely upsetting, and though it's understandable that their son and daughter have their own lives with their own problems, their frequent lack of respect and compassion is frustrating. Thankfully, Ozu chooses to contrast this unsavory behavior with the selfless kindness of Noriko. While she is just their daughter-in-law, and her husband has been dead for eight years, Noriko treats the Hariyami's as if they were her own flesh and blood, going out of her way to make sure that they are taken care of and comfortable. She becomes the film's shining beacon of hope, illustrating mankind's potential for affection and compassion -- but not in some grand, operatic, or messianic manner. Her good deeds are of the simplest order, but the pure thoughtfulness of each understated gesture is inspiring and heartwarming. As a quintessential example of Ozu's unique and unassuming visual style, the camera here becomes a quiet and gentle observer. The director is known for his low angle shots which capture the action from close to the ground and his frequent use of cutaways featuring landscapes, and all these trademarks are clearly evident throughout 'Tokyo Story,' giving it a subtle but deliberate aesthetic. Cuts are mostly functional, taking us from room to room as characters move through their homes, once again emphasizing the simple nuances of daily life. Likewise, camera movements are extremely rare, with the director instead employing static shots to capture all that needs to be seen with little fuss and fanfare. With that said, Ozu's framing and compositions are impeccable, and his attention to detail is second to none, giving each individual shot a rare sense of authenticity. All of cinema's most overt tricks and techniques are basically put aside, whittling away filmmaking style until only the very essentials are left, creating an air of palpable, undiluted truth. A real definition of art might forever elude us, but 'Tokyo Story' is as enduring and affecting an example as any. Ozu's masterpiece is widely regarded as one of the greatest movies ever made, and the director has become the source of nearly fanatical adoration from many subsequent filmmakers who continue to herald his work -- and it's really not hard to see why. Through its universal story of family, the film becomes a quiet symphony of life, offering gentle and often bittersweet musings on everyday existence. A devastating chronicle of mankind's "natural" progression toward selfishness, and an uplifting testament toward our similarly innate ability to love and sacrifice, Ozu's tale links youth and old age, cruelty and kindness, life and death. Through contrasts, tragedy, and simple truths, 'Tokyo Story' reminds us that all things are connected, that every piece is but a part of a larger, cyclical story. Like any truly indelible piece of art, its insights are timeless. It might sound incredibly hyperbolic, but in many ways, all that ever needs to be said about humanity can be found here, and even generations from now viewers will be able to watch this film and know: This is who we were. This is what we felt. Good and bad. 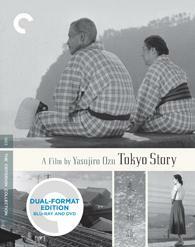 Criterion presents 'Tokyo Story' in a Dual Format Blu-ray/DVD combo pack. A BD-50 Region A disc and two DVDs come packaged in a foldout case housed in a cardboard slipcover with spine number 217. A booklet featuring an essay by critic David Bordwell is also included. Audio commentary featuring Yasujiro Ozu scholar David Desser, editor of Ozu's "Tokyo Story"
The movie is provided with a black and white 1080p/AVC MPEG-4 transfer in the 1.33:1 aspect ratio. Though not perfect and somewhat limited by the source materials, this is a pleasing image that gives the film a very worthy presentation. Sadly, the film's original negative no longer exists and the transfer was instead sourced from a new 35 mm interpositive made from an internegative. The results are good, but not quite exceptional. A light to moderate layer of course grain is visible throughout, but the grain lacks some of the rich texture found on other classic releases. The print itself has been cleaned up well, but there are faint vertical lines and other small blemishes apparent from time to time. Clarity is pretty good, revealing nice details in the film's production design and costumes, and while the image is on the flat side, Ozu's impeccable framing is rendered well. The movie's grayscale is also nicely balanced with good contrast, though black levels can look a little elevated in some shots. Though mostly problem free, I did detect what looked like some extremely subtle signs of compression in dark backgrounds. Given the lack of an original negative, this is likely as good as 'Tokyo Story' can look, and thankfully the results are quite good. Detail is a little on the soft side in some scenes, but Ozu's distinct style is preserved respectfully. The audio is presented in a Japanese LPCM mono track with optional English subtitles. There are some minor age-related issues, but the mix sounds quite good and the subtle sound design is very effective. Dialogue is comparatively thin and a little muffled at times, revealing the limitations of the source recordings and their age. Likewise, music sounds a tad strained and in the main titles sequence a bit distorted with relatively flat range. The mono mix actually features some interesting sound design work, however, and Ozu's use of specific sounds to further the ambiance and thematic core of his story can be quite striking. Trains, wind, crickets, passing boats, and ticking clocks all become important pieces of the film's overall mood, and the simple sounds come through well. Some slight background hissing is audible in some scenes, but other major technical issues are thankfully absent. The audio does show some age, but that's understandable. The delicate sound design itself is strong, and the mono mix is faithful to the director's intentions. Criterion has put together an exceptional collection of supplements including several documentaries about the director. All of the special features are presented in upscaled 1080i with Dolby Digital 1.0 audio and optional English subtitles for the foreign language portions (unless noted otherwise). Commentary with David Desser - Recorded in 2003, this is an informative but fairly dry track. Desser offers a steady, often shot by shot analysis of Ozu's visual and narrative style. He also addresses the movie's larger themes and lasting impact, and shares some production trivia. It's not exactly essential listening, but there's a lot good information here for Ozu fans. Talking with Ozu (HD, 40 min) - Here we get a 1993 documentary that features several filmmakers, including Stanley Kwan, Claire Denis, Paul Schrader, and Wim Wenders, reflecting on Ozu's importance and impact on their own work. I Lived, But… (HD, 2 hrs & 3 min) - Presented in 1080p, this is a 1983 documentary about Yasujiro Ozu that features interviews with several actors he worked with, as well as critics and other filmmakers. The director's early life and path to filmmaking are all traced, and the doc goes through many milestones in his filmography with clips. The participants all share interesting insights into Ozu's very meticulous and occasionally demanding directing process, and some fun anecdotes about his drinking habits are also revealed (apparently he and his co-writer went through about 100 bottles of sake per script). Well produced and full of worthwhile stories and facts, this is a great inclusion. Chishu Ryu and Shochiku's Ofuna Studio (HD, 45 min) - Presented in 1080p, this is a 1988 documentary about actor Chishu Ryu and his films for Shochiku Studios, including his many Ozu collaborations. Ryu shares many stories about his work himself, and we are treated to many clips from his films. The doc also chronicles the demolition of Shochiku's Ofuna studio where Ryu made many of his movies, bringing a rather bittersweet tone to the whole piece. Like the previous doc, this is well worth a look. Trailer (HD, 4 min) - The film's trailer is included in 1080p. Yasujiro Ozu's 'Tokyo Story' is a bittersweet examination of family, life, and death. Through its delicate style and effortlessly complex themes, Ozu taps into the very heart of humanity and cinema, creating a lasting masterpiece that continues to be one of the greatest movies ever made. The video and audio show some age and limitations, but are very solid. Criterion has included a fantastic collection of supplements that offer many worthwhile insights into the director and his unique style. This is truly an essential piece of filmmaking, and thankfully it has been given the Blu-ray treatment that it deserves. A peerless example of cinema as art, this disc belongs on every classic film fan's shelf.